Smoothies are a beautiful way to start the day. Consuming smoothies is much more filling than the juices, also smoothies leave you feeling bursting with goodness and energy in the morning. And what is more important, they’re so quick and easy to prepare. Try to add smoothies to your daily morning routine, it’ll make you feel much better than almost anything else. 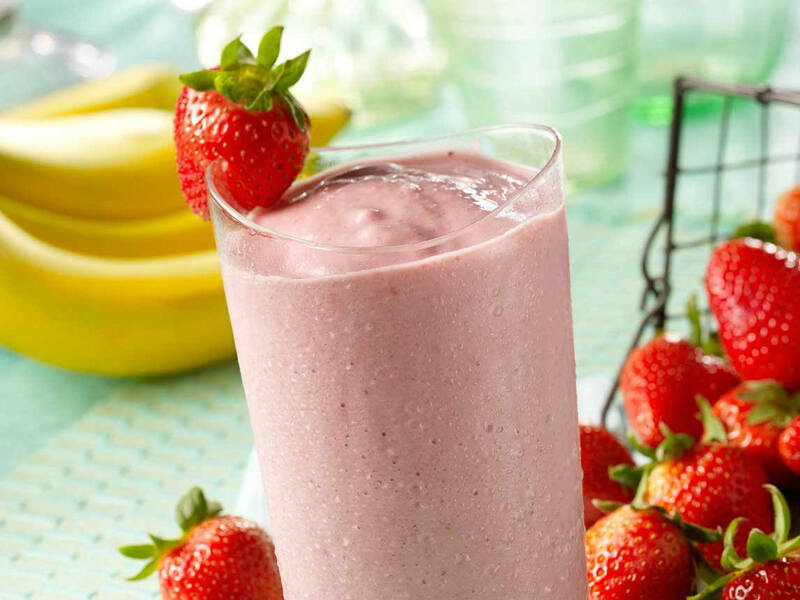 We are suggesting you to try this amazing strawberry, banana and almond milk smoothie. Strawberries and bananas are a classic combination that come together to form a delicious smoothie. Whether you want a quick, easy, and healthy breakfast or dessert for the day, this recipe is a great choice. Strawberries are excellent source of antioxidant-promoting manganese and vitamin C. They are also a very good source of iodine, folate, vitamin B6, dietary fiber, and omega-3 fatty acids. Plus, strawberries are naturally sweet and delicious. The potassium-rich bananas are among the widely consumed fruits. It’s naturally delicious and healthy. It contains numerous essential nutrients, and have benefits for heart health, digestion, and weight loss. Also, high fiber in bananas can help normalize bowel motility. One of the greatest snacks you can eat to help you lose belly fat are almonds. Almonds possess many numerous benefits including getting rid of stomach fat. These delicious nuts are low in calories and abound with great fat burning compounds. They are high in magnesium which has been proven as a key component for muscle building and the more muscle you build the more fat you burn as a result. They are also packed with useful nutrients like Vitamin E, mono-saturated fat (‘good’ fat) and fibre, which is highly satiating, makes you feel full quickly and provides bulk to food without adding calories. They are also full of B vitamins and zinc, which helps stop sugar cravings, plus the oleic oil in the nuts cuts hunger very quickly. A study in the American Journal of Clinical Nutrition supports this by showing how eating almonds suppresses your hunger by over 30 %. Another study done at Harvard’s School of Public Health found that eating almonds at least twice a week reduced stomach fat in women compared to those who rarely ate almonds. In addition to fiber, almonds also contain protein that will give you energy and prevent overeating. Almonds are perfect solution for losing weight, burning excess fat, getting energy and healthy skin. Try to add them to your diet as more as possible and expect great stomach-melting effect. For best results it is recommended to use in the morning, either as a breakfast or as a snack between breakfast and lunch. Add all the ingredients in the blender and blend until the mixture is smooth. If you like your smoothie to be a little less thick, then add a little more almond milk. Serve the banana and almond milk smoothie in a glass and add a few strawberries on the top.